Antipsychotics have complex mechanisms, but also many similarities that are of concern when drugs are co-prescribed. This paper examines how the pX values in Reaxys® Medicinal Chemistry simplify comparisons between diverse antipsychotics with a view to better avoidance of harmful drug−drug interactions. Over 30 antipsychotics have been marketed since the early 1950s. The majority of pharmacokinetic drug-drug interactions involving psychotropic medications are due to the cytochrome P450 (CYP) system. Treatments for schizophrenia: a critical review of pharmacology and mechanisms of action of antipsychotic drugs. Mol Psychiatry 10: 79–104. Primary care companion. J Clin Psychiatry 5: 9–13. . Over 30 antipsychotics have been marketed since the discovery of the first neuroleptic, chlorpromazine, in the early 1950s. Their mechanisms of action are still not fully understood, but they are known to antagonize several neurotransmitter receptors. Since long-term administration is unavoidable, options for fewer and less severe adverse events are highly desirable. This may be sought either by new drugs with novel safety profiles or optimization of the efficacy of available drugs. Actions of novel antipsychotic agents on apomorphine-induced PPI disruption: influence of combined serotonin 5-HT1A receptor activation and dopamine D2 receptor blockade. Neuropsychopharmacology 31: 1900–1909. . In this study, Reaxys Medicinal Chemistry was used to retrieve pharmacological, biopharmaceutical and toxicological information on several antipsychotic drugs to explore their pharmacological activity and their ADMET (absorption, distribution, metabolism, excretion, toxicity) properties. The focus was on metabolic characteristics and cardiac hERG (human ether-a-go-go related gene) channel blockage. Reaxys Medicinal Chemistry has been designed to give access to detailed experimental biological protocols as well as chemistry data coming from relevant literature (articles and patents). The database covers several domains of pharmacology and contains large amounts of experimental data related to a variety of different systems that enable R&D scientists to accelerate drug discovery process at all stages. On completing a general search for Antipsychotics using Ask Reaxys , 17,801 relevant citations were found, of which 11,484 substances, 32,551 bioactivity data points, 511 targets and 11,532 reactions were extracted. This general search was narrowed using the Open Analysis View and by selecting only Marketed Drugs (Figure 1A). To facilitate comparisons of bioactivity data from different publications and assay types, all the data points in Reaxys Medicinal Chemistry have pX values. pX values are calculated by transforming parameters such as EC50, IC50, Ki into the –log equivalent (pEC50, pIC50, pKi). These are normalized values assigned to the data that enable easy quantification of compound–target affinity and comparison of information from all around the world. An affinity profile for the most potent marketed antipsychotics, with pX values of greater than 8.0 (affinity < 10 nM), can be generated and viewed as a Heatmap (Figure 1B). 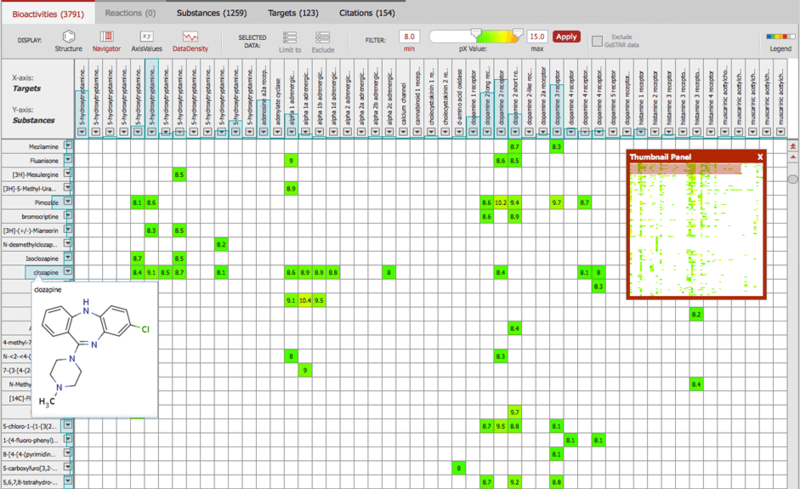 The Heatmap visualizes the relationships between compounds and their targets in terms of key parameters, allowing rapid identification of relevant compound–target interactions. 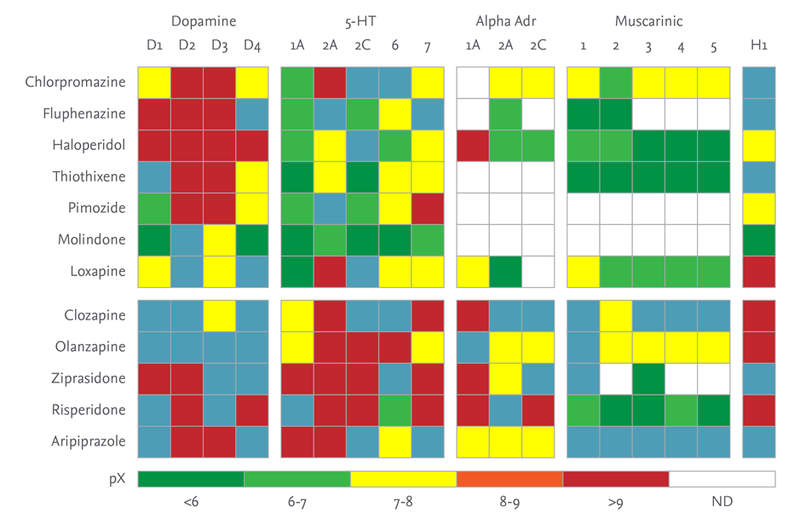 The Heatmap displays all marketed antipsychotics with a pX above 8.0 and the associated target protein for which in vitro biological data has been mined from the literature (Figure 1B). Biological affinities or activities are quantified as a pX value and displayed from 1 (low activity) in blue to 15 (high activity) in red. Further analysis of the dataset can be achieved using the data density display, which presents the number of molecules retrieved per target. To assess target profiling, drug−drug interactions and hERG activity of antipsychotics, pX values were retrieved from the Reaxys Medicinal Chemistry database. Using the Heatmap, a selection of marketed antipsychotics was chosen for the study. Figure 1. A The histograms generated using Analysis View to relate the highest clinical phase (marketed drugs selected; left histogram) and most common targets for antipsychotics (right histogram). B The Heatmap for marketed antipsychotics with pX activities above 8.0 (affinity < 10 nM). Clozapine is highlighted. First-generation antipsychotics (FGAs) including phenothiazines (chlorpromazine and fluphenazine), butyrophenones (haloperidol), thioxanthenes (thiothixene) and diphenylbutyl-piperidines (pimozide) show, as previously well-described, a strong affinity for human dopamine D2 receptor (Figure 2). In addition, phenothiazines-derived molecules exhibit noticeable activity toward histamine H1 receptor, as expected since the first phenothiazines were developed for their anti-histaminic properties. Interestingly, compounds belonging to the same class display different pharmacological profiles, such as between chlorpromazine and fluphenazine (Figure 2). Figure 2. A receptorome for several antipsychotics regarding some dopaminergic, serotonergic, adrenergic, muscarinic and histaminic receptors. Data retrieved from Reaxys Medicinal Chemistry in July 2015. In general, second-generation antipsychotics (SGAs), including clozapine, olanzapine, ziprasidone and risperidone, demonstrate strong affinities for the human serotonergic 5-HT2A receptor compared with their affinity for D2 receptor. In contrast to FGAs, SGAs profiles are similar within the same chemical class. Interestingly, the classical FGA loxapine (Loxitane®, 1975) shares analogous receptor binding results with clozapine and olanzapine, probably related to their similar chemical structures. Moreover, the FGA dihydroindolone, molindone (Moban®, 1974), presents an atypical profile with weak affinity for all human GPCRs tested in binding assay. Aripiprazole (Abilify®, 2002), has an original chemical structure unlike existing psychoactive drugs, as well as a unique pharmacological profile. Aripiprazole possesses potent activity towards the D2 receptor and the 5-HT2A receptor.